1) Thank you to the more than 80 of you who answered the poll about how you choose your books. Only 47 of you let me know you participated, so I used random.org to choose the winner from 1 -47. MARIS BENNETT is the winner! Maris, please email me at womensfictionwriters @ gmail dot com to claim your prize! If Maris doesn’t get in touch with me (she did not leave a way to contact her) then I’ll choose another winner next week. When there’s a prize, someone has to get it!! 2) I took the medium-sized leap last week and purchased the domain name for Women’s Fiction Writers. What does that mean? It just means that when you want to tell eleven zillion of your friends about the site, you can direct them to womensfictionwriters.com, WITHOUT the addition of “wordpress” in the middle. But, if you do use the old url, you’ll still land here. Isn’t that swell? 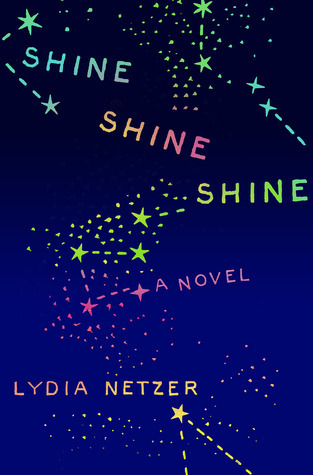 3) The most exciting part of today is that SHINE SHINE SHINE by Lydia Netzer launches out into the universe. And tonight, at 7:30 Eastern Time (6:30 Central) I’m hosting a LIVE ONLINE party for Lydia. What does that mean? It means you log on – it’s easy – it’s free – did I mention it’s easy? – and I’ll be there with Lydia and lots of other people, asking questions, hearing about her book and having a grand time, most likely with a cocktail. Think of it as a chat room, but your webcam allows everyone to see you and hear you. I’m the MC — or I like to think of myself as the the author behind the curtain. I’m going to be handling the technical end of things AND be there to make sure everything runs smoothly — and to chat it up!!! SHINE SHINE SHINE has been getting rave reviews – please check it out here. Want to hang out tonight with me and with Lydia and lots of special guests and writers and readers? Go here — register — and you’ll get the information. They send you some kind of ticket (that you don’t need) but it gives you access to the site 15 minutes before the official opening. Even if you can’t spend the whole hour with us, stop in and see this amazing technology that authors are using to connect with their readers. I have nothing to do with the company behind the technology, Shindig, except that I think it’s cool and I’m thrilled that I know how to host an event! C’mon and join us — I got my hair colored and cut just for the occasion! And I’d love to SEE you, for real!! « Author Erica Bauermeister Wrote Her First Novel When The Characters Talked To Her. Don't Laugh, Writers. You've Been There! Ohh… fabulous. Lydia’s book has been in my TBR list since I discovered it on Good Reads last week! The technology sounds fabulous, too but – alas (and boo hoo), that’s 4:30 here in Arizona, and I won’t be able to attend. POO! Would love to meet Lydia and see how the technology works! Hmm.. maybe some shuffling/schedule rearranging is necessary? You can hang out for a bit, Melissa, if you can’t make it for the whole hour. It should be fun!